Carnival Corporation has filed a claim for $12 million damages (£8 million) after one of its ships was damaged when it broke free from moorings during a violent storm. The lawsuit, against UK-based BAE Systems, claims that defective mooring equipment in its shipyard in Mobile, Alabama, failed to hold Carnival Triumph when the ship was hit by winds of up to 66 mph. The ship was towed into Mobile from the Gulf of Mexico in February, after an engine room fire left it crippled and without power. After disembarking 4,200 passengers, the 101,000-ton vessel was taken to BAE’s yard for repairs. During the storm, on April 3, it was set adrift on the Mobile River for several hours, during which it collided with a US Army dredger which was also undergoing repairs. None of the 600 crew on board Triumph was injured, but two security men who had been in a shed on the quayside were blown into the water. One drowned, and his widow has issued a claim against Carnival. 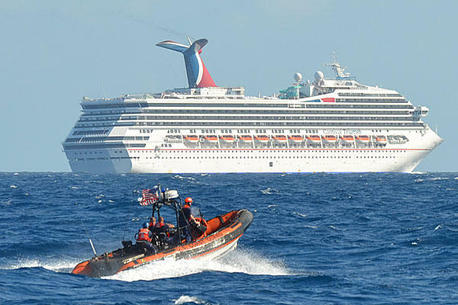 The claim from Carnival seeks to establish that it was not responsible for damages, and also alleges the incident has cost the company more than $12 million. The lawsuit maintains that Triumph was “completely dependent on shore power and other services provided by BAE” because its generators were not functional. “At about 1:30 pm, during a rainstorm, four of the bollards on Pier K to which the mooring lines of the Triumph were tied failed and broke free from the pier, three at the aft end and one at the forward end. This in turn placed increased load on the remaining mooring lines and compromised the integrity of the entire mooring arrangement, causing the Triumph to break free from the pier,” the complaint states. In addition, the suit claims failure of BAE’s bollards, or metal posts to which mooring lines are attached, is directly responsible for Triumph’s unscheduled departure as well as breakage of the supply lines, including the power supply. The suit also alleges both the bollards and their fasteners were “outdated, severely deteriorated, defective and unsuitable for mooring the Triumph” and that BAE was aware of Pier K’s shortcomings prior to the vessel’s arrival in February. Following the repairs, Triumph returned to service on June 13, from her home port of Galveston, Texas. A total of $115 million was spent on repairs and upgrades to the 14-year-old vessel.